Last winter saw a flurry of limited release #tinnage beers come out of Mornington Peninsula Brewery. This winter, with the small matter of a barrel program kicking off to add to the workload, the jazzily attired cans have been lesser spotted, making this red IPA the first to leave the brewery since the much-loved Brain Squeeze. It's a style that's been appearing with more frequency in the local beer world and here takes its name from the one of the moons of Saturn – apparently the smallest astronomical body known to be rounded in shape because of self-gravitation. 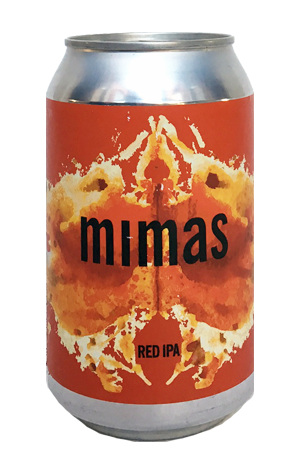 You might ask what that has to do with the beer and they tell us it's because: "Mimas the beer, much like the moon, is in a delicate balance." Delicate might be pushing it, given the beer tips the scales at 7 percent ABV and has the sort of hazy look that suggests they've not held back on the hopping front. Indeed, you're hit with candied orange, sweet apricot and tropical fruit aromas, the lively sweetness reinforced by the specialty malts. Those malts are more apparent to taste – sweet and biscuity – and it would appear the hops were loaded up late in the day as they deliver flavour more than any astronomical bitterness.